Because of Alaska's substantial coal resources, there is a question of the viability of coalbed methane production in the state. Exploring for coalbed methane in Alaska. Critical factors for coalbed methane production. Clark, Art (USGS) and Bob Fisk (BLM). 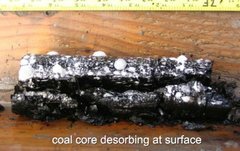 "Results from the Coalbed Methane Exploration and Testing Project, Wainwright, Alaska 2007-2008." Presentation from 2008 Alaska Rural Energy Conference. Clough, Jim, Jim Albright, Charles Barker, Bob Fisk, Rick Miller, and David Ogbe. "Coalbed Methane for Remote Villages." September 2002. Presentation.